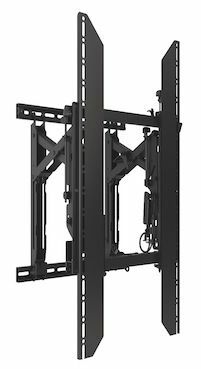 The What: Chief has introduced the ConnexSys Video Wall Mounting System, designed to solve the most common problems installers often run into on the worksite. The Why: After extensive research and conversations with customers, the Chief team determined the largest issues facing installers with video walls were speed of install, ease of alignment, access for serviceability, and rigidity to maintain adjustments. "I think the outstanding part of Chief is how much the customer plays a part in the development cycle," said Kathryn Gaskell, product manager. "Alignment can take up 50-70 percent of the install time," Gaskell said. "This new system quickly aligns rows for substantial time savings. For massive video walls, it's exponential." Single strut channel install per row – for large walls, installers simply level a single strut channel and hang the mounts. This quickly aligns the entire row and removes the need for spacers to measure horizontally between mounts. The mounts work with strut channel that can be easily sourced locally. For multiple rows, simply use the height of the screen to measure between each row rail. PowerZone Adjustment – 6 points of tool-free height, tilt, lateral and depth adjustment are all found in one easy-to-access location. One tilt pivot point and a floating plane protect the display from damaging twisting and eliminate transfer of torque from the wall to screen. Three levels of lateral adjustment allow for precise alignment and protect screens from unnecessary collisions. Depth Adjustment – No wall is perfectly flat, and the more screens are added, the more difficult aligning video walls becomes. ConnexSys mounts allow the home position to be set anywhere between 4 to 7.3-inches (102-186 mm) from the wall for perfect depth. Independent depth adjustments can be made on both sides of the mount to accommodate walls up to 2-inches out of alignment horizontally. This helps meet needs for large video walls, recess video walls where matching the outer surface can be particularly difficult, and even single display recess applications. RapidDraw Display Release – A controlled pull cord release gives installers access to any display on the video wall, removing the possibility of accidental pop-outs from people bumping into screens. The release also protects the displays by reducing the frequency and aggressiveness of screen pushing. Cords can be positioned to pull for release from any side. The mounts can be pulled out up to 13.7-inch (348 mm) from the wall for ample access space. Engage the kickstand to 20 degrees for even more room to work. Rigidity – A particular problem for installers is that displays lose their alignment if they are pulled out for service. Overzealous cleaning crews can also accidentally shift display alignment. Chief engineers added rigidity to the solution to prevent accidental screen shift from occurring when the screen is pulled out. ConnexSys is available in landscape (LVS1U) and portrait (LVS1UP) versions with rails, and can be ordered without strut channel (LVSXU and LVSXUP) so installers can take advantage of longer lengths from local sources.